First Line:"Someone should warn you that move-in day at a college is the last day you should actually try to move into your dorm." 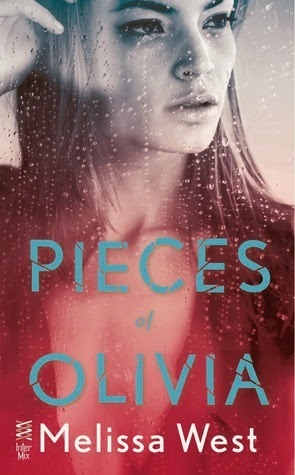 Review: I love Melissa West's The Taking series so when I saw Pieces of Olivia and who the author was I knew I had to grab it. Yes this is a contemporary vs her other series which is Sci-Fi but I love her writing so I picked it up and I really enjoyed it. Olivia is broken she has suffered something that I can't even imagine having to go through. I found myself connecting to her instantly, it was hard not to. West has a way of writing that makes you feel the characters pain right alongside with them. What made it even that much more better were the letters Olivia wrote to Trisha, every time I read one it just made my heart break but through those letters you really got to know Olivia's state of mind. There were other characters I really loved which was Kara, Olivia's roommate and Preston, Kara's best friend. Kara was as good of a friend as they come but you know there is more to her then meets the eye and luckily she has her own book, the second in the series call Miles From Kara so we see what she is really about. Preston is a player of sorts but he is only like that because of something that happened in his past which isn't your typical heartbreak story but much more than that which causes him to be pretty non-committal until he meets Olivia. I personally would have loved to see a few chapters in Preston's point of view, I don't know about you guys but I love dual point of views in books that have two characters both with very interesting and broken pasts, it helps me connect better with them. The book mostly dealt with healing especially for Olivia and that is where Rose came in. If I have to go to therapy for any reason I want Rose. I loved her. At first I thought she was some crazy lady but she was perfect for Olivia and even though Olivia didn't see it till later Rose had become more a friend to her then just a therapist. Overall great read, I've already read the next book in the series and will be putting up a review for that one as well.